Welcome to the Path to Anandam’s online media room. Here you will find a collection of current and archived news about our present, past and future activities. We encourage you to check back every now and then for the latest happenings within our organization. Opent to the Fountain of Happiness! What Does Goddess Durga Symbolize? 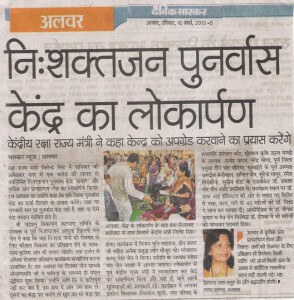 Kalash Sthapna: 1st Navratra, Sept. 28th Wednesday at 10:30-1:00 PM, Sattvic Lunch to follow. Sai Baba’s Bhajans: Sept 30th at 7:00 – 8:30 PM Dinner Prasad to follow. MATA KI CHOWKI: Oct 1st Saturday at 5:30 to 8:00 PM Dinner Prasad to follow. Havan of Chandi Path and Kanjake poojan: Oct 5th, Wednesday at 10:00 AM – 1:00 PM. Lunch Prasad to follow. How we spiritualized our business. 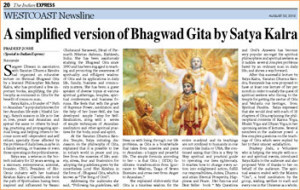 Dominican University of California uses the book “My Questions and God’s Answers” on the Bhagavad Gita by Satya Kalra in the Hindu Religious Philosophy: Dharma, Gandhi, and Gender course this summer. University of Berkeley uses the book “My Questions and God’s Answers” on the Bhagavad Gita by Satya Kalra in Religious Studies Program on Indian Ethics course this spring.